Welcome to Lake Michigan Destinations... Come Travel Northern Lake Michigan! When choosing a vacation spot, there's no finer destination than the communities of West Michigan. They all have something unique to offer...but the one thing they have in common is Lake Michigan and its glorious beaches. Set away from the hustle and bustle of the larger cities, this is a place you can truly relax and feel at home. Starting at the northern-most city of Manistee, you'll find historical architecture, the magnificent Ramsdell Theatre and the Manistee National Forest. Mention the name Ludington, and you'll hear "Oh, I just love that city!" That's because there's so much to love...from its beloved S.S. Badger carferry to the North Breakwater Light to the various family-friendly festivals throughout the summer. The Ludington State Park is the #1 state park in the midwest and has everything you could ever want--campgrounds, dam, lighthouse, two beaches, forests, and marshlands. People come year after year to vacation at Hamlin Lake...12 miles long and 5,000 acres large. Just four miles north of Ludington, this is the perfect lake for fishermen and those who enjoy boating. Heading south to Pentwater, you'll enjoy the quaint, artsy shops and Charles Mears State Park. If wild adventure is more your style, ride the dunes at Silver Lake. These 2,000 acres of sand dunes are perfect for ORVs, or explore them in a guided jeep tour. Northwest Michigan is known for some of the most amazing scenery in the state. The largest destination in the northwest is Traverse City, the Cherry Capital! One of Michigan's most beautiful destinations, this is home to wineries, museums, lighthouses, beaches, golf courses, and the magnificent Sleeping Bear Dunes. While traveling in Northwest Michigan, be sure to enjoy the many small communities along the way. The popular M-22 route takes you from Manistee to Benzie County, then on through the Leelanau Peninsula to Grand Traverse County, home of Traverse City and the Old Mission Peninsula, famous for its many wineries and tasting tours. Northern Michigan has been attracting visitors to its shores for more than a century. And it is no surprise that this part of Michigan continues to draw visitors and summer residents year after year. What could be more alluring that the brilliant blue waters of Lake Michigan, glorious beaches, and a myriad of activities that could fill every day from dawn until dusk. As you travel north on US-31, coming down the hill into downtown Charlevoix is a sight to behold, nestled between Lake Michigan and Round Lake. It has been the summer place for generations for people from the Midwest. Situated on Lake Charlevoix, Boyne City is a gem in Northern Michigan's crown of jewels. This growing, bustling city has it all: music, art, fun, outdoor activities, dining, shopping, biking, skiing, and more. Ernest Hemingway is not the only person to find beauty and relaxation in Petoskey. With the backdrop of Lake Michigan's Little Traverse Bay to enjoy, their Gaslight District is the place to visit for terrific shopping and dining. Situated on a beautiful natural, deep harbor, Harbor Springs is a tiny community with big things to offer...a wonderful downtown business district has fabulous shopping overlooking the water. A trip to Michigan would not be complete without first visiting Mackinaw City, right at the "top of the mitt." This small, quaint town has great shopping and dining...and is the take-off point to Mackinac Island. Catch one of the many ferries that shuttle you from Mackinaw City to this turn-of-the-century island, where no vehicles are allowed. Make sure you sample some of their famous fudge! Wisconsin also shares the Lake Michigan coastline, and has destinations in the northern part of the state that the entire family will enjoy. Fruit orchards, football and fun...that describes this area of Wisconsin! 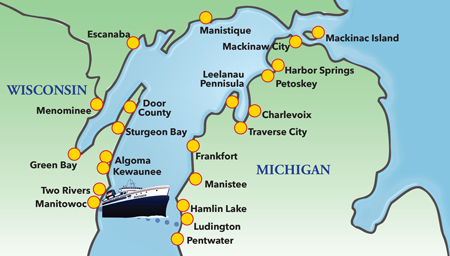 Manitowoc is the Wisconsin destination for the S.S. Badger carferry that sails every summer from Ludington, MI across Lake Michigan. Fishing, water sports, golfing, hiking, and biking are some of the great outdoor activities Manitowoc is known for. Door County, called "the Cape Cod of the Midwest," is surrounded by water on three sides and juts out into Lake Michigan. Lighthouses, fruit orchards and Sturgeon Bay are the highlights of your visit to Door County. Football fans know that Green Bay is home to the Packers, one of the oldest teams in the NFL and Super Bowl champs. It's the third largest city in Wisconsin, and also has wineries, parks, botanical gardens, and great fishing. If you've never experienced the fun...the excitement...and the sheer pleasure of the Wisconsin Dells,...you're missing the vacation of a lifetime. No other place boasts more waterparks than the Dells, large and small, indoor and outdoor. Combined with terrific recreation, festivals, theaters, and museums, there's something for everyone at Wisconsin Dells.